experiences and decisions. So she wrote a play about it, because that's what artists do. The result is a frank, funny, and almost unbelievable story that touches on many common and relatable issues. 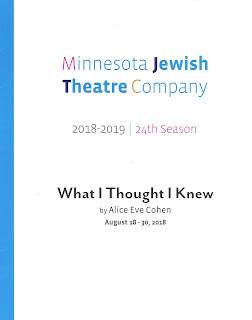 For their production of What I Though I Knew, Minnesota Jewish Theatre Company enlisted Kim Kivens to perform the solo piece, a wise choice indeed. As much as anything else, the play is about storytelling. About our need to tell stories, our need to listen to each other's stories. Alice's story is a remarkable one, and listening to it, as told by the team at MJTC, is a joyful, heart-breaking, moving experience. I'm not going to recount Alice's story here, you'll have to go see the play for that. Suffice to say that at the age of 44, after being told she was infertile and unable to carry a baby to term, and therefore adopting the one child she thought she'd have, she found herself six months pregnant. Surprise! 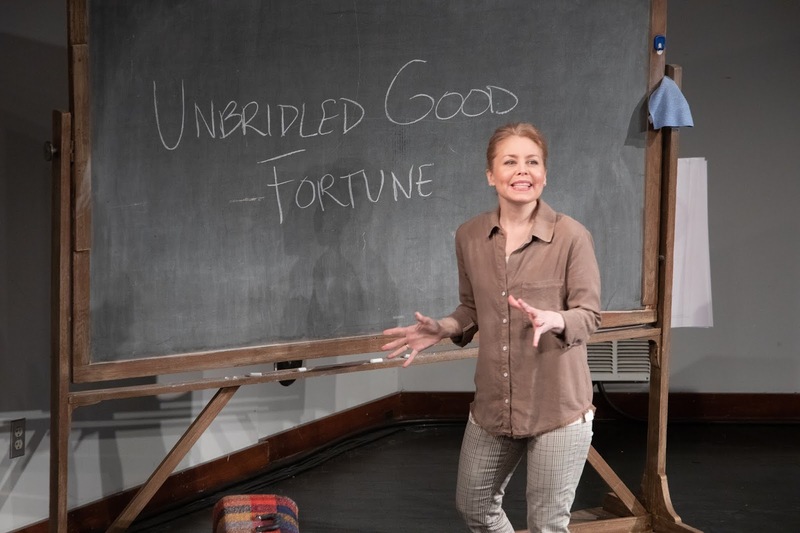 This turned her happy settled life as a theater artist/teacher and single mother with a fiance upside-down, and threw her into a life of doctor visits, tests, lawyers, and decisions. Impossible decisions that had to be made quickly. Alice's story is one of those "truth is stranger than fiction" stories, that you would think was over the top if it were fiction. In just 90 minutes we cover infertility, adoption, abortion, intersex children, children with special needs, the perils of late in life pregnancy, the difficulties of navigating the health care system, and medical malpractice. Phew, that's a lot to cover, and a lot to think about. I've long been a fan of Kim Kivens, firstly for her comedy and musicality, but she's proven recently that she can do drama too. She gets to do it all here. The program lists over 40 characters that she plays; I lost count. First and foremost she's Alice, the playwright, storyteller, and woman going through a crisis with humor, fear, and much humanity. We really feel for Alice and want things to turn out OK for her. Kim also plays every other character in Alice's life - her fiance, her 8-year-old daughter, her fetus, her family members, and too many health professionals to count. Some are represented by a prop (suitcase for her traveling musician fiance, lamp for her daughter), but most are distinguished only by voice and physicality. Some are funny, some are silly, some are deadly serious, but you never lose track of who's who in the story. The stage space at the Highland Park Center Theatre is bare to the walls, the only set pieces a chalkboard (upon which Alice writes chapter titles in this book of her life), chair, the aforementioned suitcase and lamp, and a versatile table on wheels with a picnic basket containing necessary props. Not only does Kim have to keep all the characters straight, but also the props (water, food, clipboard, towels) that add color to the story. She and director Jennie Ward have paced the story well; it doesn't feel hurried, with pauses to let things sink in. And it's performed with the house lights up, so that Alice is talking directly to the audience, drawing us into her story. 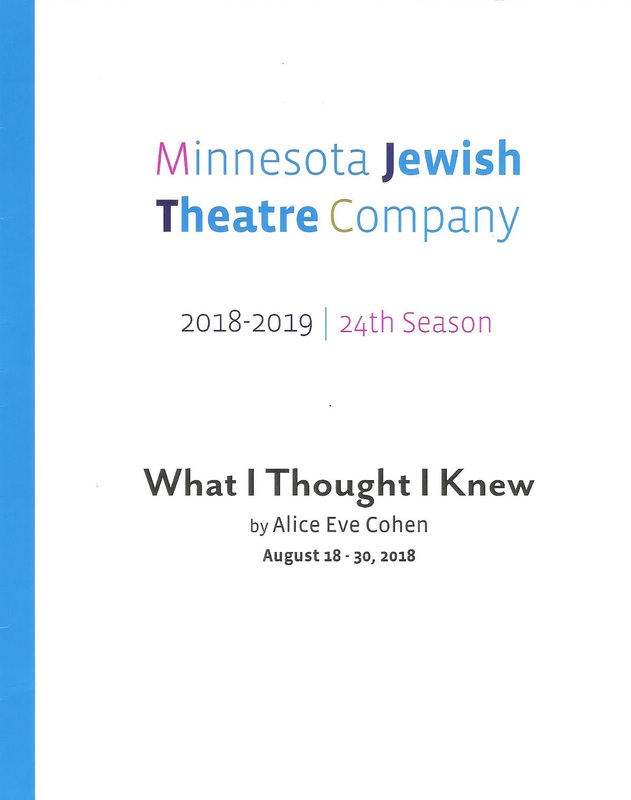 This is a truly remarkable story, well told by the playwright, director, and performer Kim Kivens in a compelling and engaging performance that's a joy (and a heart-break at times) to watch. Playing for two more weeks only, don't miss this fascinating, funny, relatable, beautiful personal story!